I might be an anomaly, I don’t know, but Cruising With Ruben & The Jets is one of my favorite Zappa albums. I get the impression that it’s one of those albums that’s kind of an also-ran for a lot of folks, but it’s definitely in my top 5. (The other four? I’m not sure. Absolutely Free is in there I know; You Are What You Is probably is too, even though it’s quite uneven… I mean, really, “Conehead”? One Size Fits All, I’d say, too. Maybe Apostrophe (‘) and Overnite Sensation? Probably Sheik Yerbouti. Wait, that’s six, innit? Ah well, whatever. Man’s made something like 90 albums.) For a long time, though, I’d only had the CD version of Ruben, which was remixed to replace the bass and drums. The new tracks sounded OK, but on some cuts sounded really out of place — I don’t think “slap bass” when I think of “50s Doo-Wop & R&B”. Fans said the original vinyl mix was much, much better, but I mostly had to take their word for it, since Ruben is one of the more expensive Zappa LPs… probably for precisely that reason. However — the new disc in the Project/Object Documentary series has answered that for me — in most respects the vinyl mix IS superior. 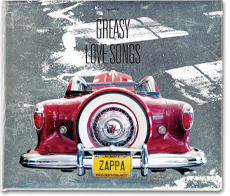 See, Joe Travers, the Vaultmeister for the Zappa Family Trust was able to remaster the original mix with the original tracks and released it, with loads of cool bonus cuts as Greasy Love Songs. Some of the 1984 remixes were an improvement — “Cheap Thrills” seemed to have a bit more pop in the remix, the original is a little flat — but for the most part, the album DOES sound better, and the bass and drums FIT the sound and, well, sound like they were recorded at the same time as the rest of the album, mainly because they were. I already adored Ruben, but now I… well, still adore it, but even more, which I wasn’t sure was possible. The bonus tracks are really cool, too. A few alternate mixes of cuts, the single version of “Jelly Roll Gum Drop” (one of the stand-out tracks on the album) and two cuts of Frank Zappa talking about the album. One, “Secret Greasings” is an un-finished radio spot featuring Zappa reading the “True Story of Ruben & The Jets” from the record liners, but “Serious Fan Mail” is a real treat — about 6 minutes of Zappa talking, taken from various lectures and interviews, about the album. Most of it is about how the speech balloon on the cover of the LP reading “Is this the Mothers of Invention recording under a different name in a last-ditch attempt to get their cruddy music on the radio?” wasn’t entirely a joke; people WOULD play the single which, in the initial pressing, made no mention of the Mothers — until they found out Ruben & The Jets wasn’t a real band (yet) and the Mothers in disguise. A station in Iowa played the single in heavy rotation — never mentioning the Mothers — which generated a lot of fan mail, including one Zappa mentions that says Ruben & The Jets are the best group since Danny & The Juniors. Hilarious as that is — the real shocker for me was a mention that the Mothers were going to Florida on tour and, seeing as they had some downtime, he’d rented some studio time to do a follow-up album to Cruising with Ruben & The Jets, only this one would actually be recorded in the same style as the original R&B albums — a mic in the room, and placing the band around it, rather than using multi-track recording like modern albums (including Cruising). I had no idea that this existed — and I’m really curious as to whatever happened to those sessions. That would be something I’d love to hear, if they exist. I love Ruben and the idea of MORE of that stuff just makes me twitch. At least my desire for MORE is sated, for now, by this great CD. Has Gail Zappa trademarked the name ‘Captain Beefheart’ and if so, WHY?